When your power factor falls below Minneapolis electric company efficiency standards, they charge a premium on the Kilowatt (kW) and/or Kilovar (kVAR) you consume. Power factor is a measure of how efficiently electrical power is consumed. This is known as a demand penalty. 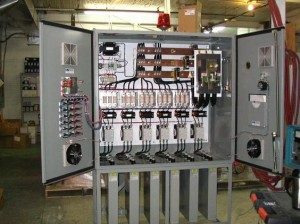 The purpose of power factor correction is to reduce the electrical load flowing to your facility, minimizing wasted energy while increasing efficiency. Power factor penalty is an incentive by your utility company to install power factor correction capacitors. Power factor correction is tricky to calculate and should be performed by a commercial electrical professional. In fact, your savings may be so substantial that the cost of power factor correction can be recovered in less than a year. Sternberg Electric is a fully credentialed Minneapolis, MN electrician who will look at your electricity bill and investigate any penalty charges. We then provide you a detailed estimate on how to correct your power factor – free of charge. We will also prepare an ROI statement (return on investment) so you can clearly see how quickly you’ll achieve PFC savings. As trustworthy, efficient and experienced Minneapolis commercial electrical contractors, we’re serious about saving you money and providing you with honest, exceptional service. We have the experience, tools, materials, and expertise to exceed your expectations. We want your repeat business and referrals. Contact us for your FREE Power Factor Correction Analysis and start saving money today!